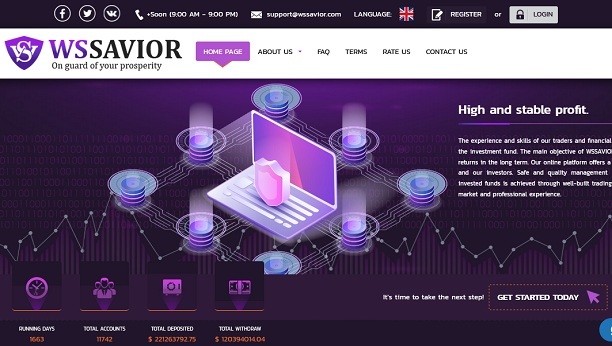 Wssavior Limited is a fully registered investment company based in the United Kingdom and Corporate Headquarters is located here: 5th floor, Marshall House Ring Way, Preston, United Kingdom, PR1 2QD. WSSH LTD registration number is №09159927. WSSH LTD is constantly expanding the geography of its activities thanks to excellent marketing strategy and break even trading. The company combines several successful profitable business directions, from the multi-currency trading in the Forex market to trading activity on the stock exchange, Cryptocurrency market and investments in promising Fintech start-ups. Their professional traders do three things that amateurs often forget. They plan a trading strategy, they monitor market daily and they diarize, track, and analyse each of their trades. All investments carry an element of risk which may vary significantly. If you are unsure as to the suitability of a particular investment or product, you should seek professional independent financial advice. Taxes, rules, rates and reliefs are subject to change without notice in the future and taxation will depend on your personal circumstances and your Country. Charges may be subject to change in the future depends on legal notice. The directors may decide to purchase and maintain insurance, at the expense of the company, for the benefit of any relevant officer in respect of any relevant loss.